The brief from our clients for this extension and renovation project was to rectify their issues with their current large country home to enhance the family’s lifestyle together with adding extra space including a Master bedroom, ensuite, robe and living and office space. 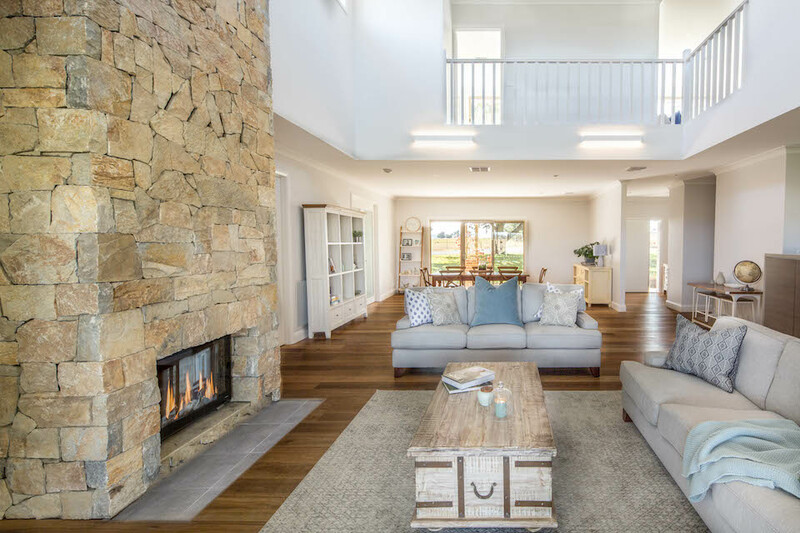 Creating a separate front entry, adding a living room fireplace and remodelling existing spaces to create an extra living space that can be closed off the main living room were all components of the renovation brief. The design was based around adding an upper floor extension including a Master bedroom, ensuite, walk-in-robe, study and an extra living space / parent’s retreat. This design also created a great void and mezzanine over the existing living room which added much drama and architectural interest to the interior. Many windows were added to the design including large floor to ceiling, highlight and triangular picture windows to capture the stunning country views from every angle and to enhance the northern aspect. A new fireplace was added to the existing living room with a spectacular dry stone chimney that soars from the ground level through to the upper floor creating wow factor and delivering the ‘hero’ of the interior. The original master bedroom was remodelled into a family room with double doors providing a separate living space off the open plan living, kitchen and dining area, an area that also provided great needed storage for musical instruments, toys and books. This family room has the functionality to be closed off when entertaining creating separate zones for children and adults. A dining space and entry was created by adding a wall to separate the two areas and another wall and coats cupboard was added to create privacy, storage and a spacious yet designated front entrance. The existing walk in pantry was reconfigured and moved forward to create enough space for the staircase to access the upper floor extension. An existing living room window was removed and the laundry door moved to make way for the show stopping fireplace and chimney to sit centre stage in the living room and upper floor void. With such a large void it was also imperative to consider the heating, cooling and energy efficiency of the home during the design process. Double glazed windows were added to the upper floor extension as well as a split heating and cooling system, whilst the fireplace would add much warmth, a fan was added for air circulation. A construction schedule was created around the family living through the project as comfortably as possible. A steel and timber floor cradle was created to house the large depths of structure within the heel of the existing roof lines offering an appealing setting for the floor level of the upper storey to sit beautifully with the existing verandahs and roof fascia. The sheer size and scale of this addition added complexities to the program including three massive tarpaulins that required attention for an hour morning and afternoon, a clever strategy to make safe the void area during construction from falls as well as separating and making the occupants safe. Access was gained via a wide scaffold from the front of the home over and onto the verandah roof. By using light weight scaffold, we created a workable platform to construct the brick chimney through the verandah and up to the upper floor of the void. Slow, careful & methodical bricklaying was required to provide the bricks and mortar to the bricklayer but not to overload the structure. This process was adopted internally and externally combined with the heat shelves required for the fireplace flue to be bricked in as we determined the heights. These heat shelves act as a heat generation source to vent through the chimney and the stone cladding and to prevent critters from nesting inside the cavity. The result that we have achieved with our clients through design and construction is extremely pleasing and the renovation and upper floor extension has enhanced and complimented the original beautiful country home. The upper floor extension sits beautifully into the existing roof line and the façade blends with the proportion and era of the existing home. The function and existing lifestyle issues of the home have been rectified as well as adding a sense of elegance and countrified style to the interior of the home. The home now works beautifully offering many separate zones catering to all the lifestyle requirements of the family. The addition of the new master suite, ensuite, walk-in-robe, study and extra living space in the upper floor extension has created a separate ‘parent’s wing’ that has not only changed our client’s lifestyle, future proofed the home but enhanced the interiors to a whole new design level.